A new feature from the scheme that’s given us The Levelling and Lady Macbeth. Well crafted and noble in its intent, but perhaps would have worked better as a documentary. Definitely watch out to see what Daniel Kokotajlo does next. Less a film and more a public service announcement revealing how Jehovah’s Witnesses are inhumane helldogs, Daniel Kokotajlo’s bitter, polemical debut feature takes dead-aim at religious zealotry and empties out a full clip in a single, fluid stroke. Matters initially focus on the creed’s most idiotic of laws – the disallowing of vital blood transfusions, even in the instance of saving a life. 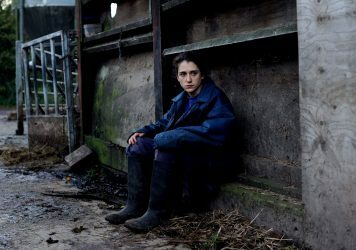 Molly Wright’s Alex battles against pariah status due to having accepted an urgent medical intervention in her youth, and even though her dead-eyed fellow parishioners – quietly stoical mother Ivanna (Siobhan Finneran) included – are bound by strict dogma, she somehow manages to keep the faith. Her older sister Luisa (Sacha Parkinson), meanwhile, is starting to see through the ruse and wants out of this automaton lifestyle of faux spiritual purity. A seedy love match between Alex and one of the Church’s up-and-coming elders emphasises just how docile and brainwashed this young naif is, even though he appears as a more progressive party within this cheerily extremist sect. As the film ominously creeps towards its mid-point, inevitable disaster strikes and Ivanna is the one left with some major soul searching to do – is it possible to live by a set of rules which fundamentally contravene the messy realities of modern relationships? While the elements of the script and the slow-burn nature of the drama are handled with due care and attention by Kokotajlo (whose film is based on personal experience), it too often feels like a hyperbolic soap opera in which characters are primed to be the most awful and ignorant versions of themselves. The coldly unflinching Ivanna is soon faced with a decision which seems absurd to the point of being unbelievable. The group of elders, who are unswerving in their dedication to this clearly crooked cause, become gruff, pantomime villains whose total lack of empathy makes it hard to view them as relatable human characters. By refusing to explain, understand or communicate why normal, working class people might opt to give themselves over to something as patently absurd (per the film’s own brutal definition) as being a member of the Jehovah’s Witnesses, the film is too ready to answer questions before it asks them. Even though the characters have big decisions to make, it’s obvious from the vantage of the viewer in each case which way they should go. The dreariness of the suburban Manchester setting enhances the idea that these people are wading through dismal lives, and so may seek this out as some kind of guiding light. Still, there is certainly some value in a story about the crossover between blind faith and emotional self harm in the peculiar epoch of Trump and Brexit. A stunning lead turn from Florence Pugh anchors this complex and compelling period drama.